In a rare pro-Democrat cartoon, presidential aspirant George McClellan is portrayed as the intermediary between Abraham Lincoln and Confederate president Jefferson Davis. 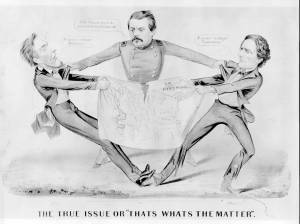 McClellan is in the center acting as a go-between in a tug-of-war over a "Map of the United States" involving Lincoln (left) and Davis. He holds the two men by their lapels and asserts, "The Union must be preserved at all hazards!" Lincoln tugs at the northern side of the map, saying, "No peace without abolition." Davis pulls at the southern portion, advocating, "No peace without Separation!!"